India is celebrating its 70th Republic Day on January 26, Saturday 2019. Every year we celebrate Republic Day because the constitution of India came into existence on January 26, 1950 replacing the Government of India Act as the governing document of India. This day is celebrated as a National festival across the country in Schools, Colleges, government sectors and mainly in New Delhi at Rajpath before the President of our Nation. On this day, ceremonious parades take place in Rajpath giving tribute to our country, showing its unity in diversity and rich cultural heritage. We at Kopykitab are celebrating the Republic Day by conducting Republic Day quiz. So Guys read our blog to know more about the exciting Quiz on Republic Day. The Quiz was successfully completed. 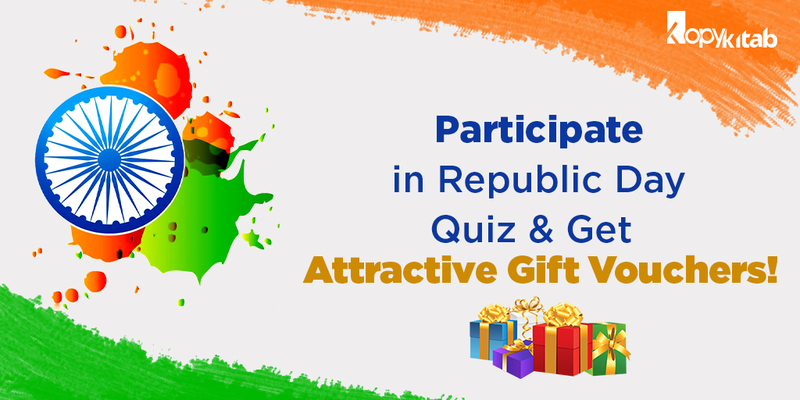 We thank each of you for actively taking part in the Republic Day Quiz. Participants can check the below table for results. We congratulate all the winners for their performance. Gift Vouchers will be sent to your respective mail id. What does Republic Day quiz include? How to Take up the quiz? Firstly when you start to take up the quiz, enter your details- Name, Phone Number, mail Id. The total number of questions in the quiz will be 30. All 30 questions are of Multiple Choice Questions with 4 options. All 30 questions will be related to Republic Day. The total time duration to complete the Quiz is 30 minutes. Participants are advised to keep a look on the time and complete the test as quickly as possible. You can toggle between questions i.e., if you do not know any answer you can switch to next question. Once you click on the option and submit, it will take you to the next question. After you have completed all 30 questions, your quiz will be submitted and you can view your score. There are gift vouchers issued for winners and runners. Top 10 winners will be rewarded with gift vouchers. If any two candidates have score same marks, then time taken will be given first priority. The details about gift vouchers are listed below in a table. Candidates can check out the table for total score and its corresponding gift voucher. Now that you have read about the Republic Day 2019 Quiz and clear about the rules you can start your quiz. You can click on the below button to start your quiz. ALL THE BEST!!! How To Claim Your Gift Vouchers? Once you are done with your quiz and submitted, you can view your score on the screen. Our team will contact you either through your phone numbers or mail id. Make sure you have given correct details while filling your name, phone number, mail id before starting the test. Winners will be informed about claiming their gift vouchers by our team.